Apple has fixed one of the biggest problems with Apple Music: the unhelpful way that a given artists’ releases were listed and displayed on the service. Previously, singles and collections were lumped together with studio albums, so if you wanted to put on a particular album you’d usually have to scroll through dozens of unrelated or redundant releases to find it. This also meant it was hard to get a sense of what an unfamiliar artist’s most significant records were. 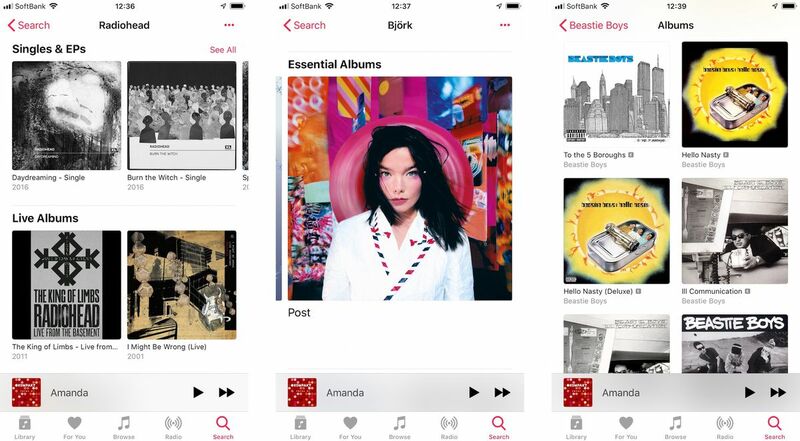 Now, things are much better — studio albums get their own section and are displayed first, while there are separate sections for live albums, compilations, and singles/EPs. There’s also a new “Essential Albums” pick that’s displayed for most major artists right under their top songs. The picks are subjective, of course, but usually seem on point for me. The Björk selections, for example, are Vespertine, Homogenic, and Post, which I can get behind. It’s not quite perfect — things like deluxe editions and remasters still clutter up the albums view, which makes it less of a neat picture of an artists’ history. But it’s still overall a huge improvement in navigation, and one I’ve been hoping would happen forever. The update seems to have been made server-side and doesn’t require any user action.